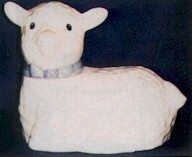 Lamb cookie jar by Metlox Pottery. THIS COOKIE JAR DOES NOT HAVE A BLUE COLLAR AND NEVER DID, IT IS POSSIBLY MORE RARE. Marked "Made in Poppytrail CA".